You may not have heard of it, but A Singapore Love Story was the most downloaded book here on the Google Play app store this year. Written by local author Low Kay Hwa, 29, it tells the story of a young couple who faced familial objections to their love. The book, which was first published in 2011 sold over 1,200 print copies this year. He declined to say how many copies it sold on Google Play. The $9.99 book, however, did beat international bestsellers like John Green's The Fault In Our Stars and E L James' Fifty Shades Of Grey on the app store. The top 10 bestselling books on Google Play were announced earlier this month. When asked how he felt about his achievement, he told The New Paper: "I'm happy and honoured. I can't find the right words to express my gratitude to my supportive readers. "I really appreciate their support over the years and hope they'll continue to support me." On why he thinks he managed to best the biggies, he said: "People are able to relate to local stories. "And the book was also featured on the front page of the Google Play app store earlier this year." But Mr Low is not about to rest on his laurels. His goal is to get to the top of The Sunday Times' bestsellers list. So far, he has only made it to the eighth spot, in 2011and 2012. He said: "I've made getting to the top of the Sunday Times' list my goal when I first started my writing career. " He also won Popular bookstore's Readers' Choice Awards for his psychological thriller I two years ago. His romance novel Today Or Tomorrow picked up the same award last year. All his books are published under his own company, Goody Books. Mr Low started writing fiction at the age of seven and published his first book, Destiny's Cries, when he was 19. He has penned 12 novels and sold over 80,000 copies in total. They are priced between $16.90 and $18.90 per copy, with each book being an average of 200 pages long. 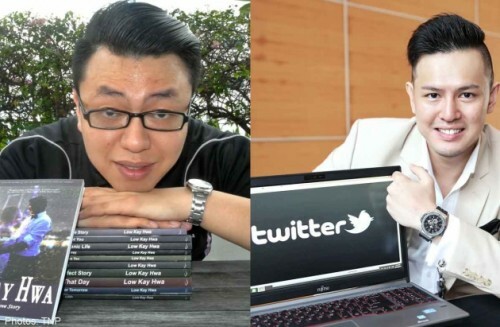 While you won't get rich as a Singaporean author, what you make is enough to get by, he said. His fans are mainly local teens and young adults, he said. While he conceded that it is difficult to stay afloat as a local author in a market saturated by international titles, he added that he relishes the challenge. He is currently pursuing a degree in English Language and Literature at SIM University, and hopes to earn a Masters in English or creative writing someday. He holds a diploma in Building and Property Management from Singapore Polytechnic. While he is best known for his romance novels, he clarified that he writes books on other genres as well. "It really depends a lot on the subject matter and the ideas that I have in my head," he remarked. The road has not always been smooth. Mr Low's writing was previously compared to that of a Secondary One student. He has also received flak over his writing style and poor grammar. He has been doing his best to improve, he said. "I try not to get defensive, but take heed of some of the constructive criticism that I've received." A fan of US author Jodi Picoult and Brazilian writer Paulo Coelho, Mr Low enjoys reading books that are on the bestseller lists of bookstores. He said: "Bestselling books tend to be more readable, and so far they haven't disappointed me. I read Star Trek novels as well, but those are the only books in the science fiction genre that I read." Mr Low said he will launch a new book next year, and plans to tap into the Malaysian and international markets. In case you're wondering, it will be a thriller, not a romance novel. It may sound a tad rude, but WTFSG is the Twitter handle for the most-followed account in Singapore this year. Managed by Mr Herbert Sim, 28, WTFSG stands for WardrobeTrendsFashion, and is a high fashion and luxury lifestyle online portal based here. With more than 530,000 followers, the account pipped those belonging to local singer JJ Lin (348,000) and The Straits Times (379,000). Mr Sim, 28, said: "When I read about the ranking two weeks ago, I was actually quite shocked. But I feel really blessed and honoured." The popular account tweets links to articles put out by the WTFSG website. The news site focuses on the arts, culture, lifestyle and fashion industry in Hong Kong, Malaysia and Singapore mostly. Mr Sim attributed the success of the site to various factors, including article syndication by online platforms. Asked if he buys Twitter followers, Mr Sim said he does not. Instead, he welcomes a Twitter "purge", similar to the one Instagram recently underwent, where accounts which post links and spam - especially bot accounts - were deleted. "We hope that Twitter will do a cleanup as well. We follow many people as well, and we can't really tell for sure if some of their followers are real or not." The WTFSG team in Singapore comprises seven people, including Mr Sim and his fiancée, Ms Vanessa Emily, who is its editor-in-chief. They started the site - which is sustained on advertising revenue - in 2009 when he was pursuing his bachelor's degree in mass communications at Oklahoma City University. His start-up cost was about $1,000, he said. "I wanted to create a lifestyle magazine to be distributed to students. But I took it online as the reach is wider." While WTFSG is not well-known here, it is linked to US music channel MTV. The bulk of its followers are from the US, said Mr Sim, who is also listed on the Internet Movie Database (IMDb) as the producer of seven short films. He worked on them during his stint in the US. On garnering such a large online following, he said: "In Singapore, there are only about 150,000 to 200,000 people on Twitter. "So to tap into the overseas market, we have to regularly raise awareness of our brand when we travel to cover events." He added that sometimes their tweets enjoy re-tweets and "favourites" that go up to the thousands. As the founder of a high fashion website, Mr Sim admitted he feels pressured to dress up. "We have to wear something different for every event. "We get sponsorship from brands and labels as they want to get their stuff featured." The most expensive item in his wardrobe is his Hugo Boss suit, which cost about $8,000. He also has a soft spot for his $17,000 Hublot watch. To increase WTFSG's readership and audience reach, Mr Sim looks to Vogue magazine and news website Mashable for ideas.